The USC Iovine and Young Academy offers a dynamic, state-of-the-art workspace called the Garage, where students hone creativity, fine-tune design skills and enjoy collaboration. With networking spaces, maker and fabrication studios, and high-powered computer work stations, students work closely with faculty and industry mentors to see their ideas come to life. Photo by Chris Shinn. With a visionary gift from entrepreneurs Jimmy Iovine and Andre Young, the University of Southern California established an academy to nurture unbridled creativity at the intersection of four essential areas: art and design; engineering and computer science; business and venture management; and communication. Conceived as a collaborative environment that brings multidisciplinary students, instructors and professional mentors together, the USC Jimmy Iovine and Andre Young Academy for Arts, Technology and the Business of Innovation has become a transformational presence on one of the nation's most dynamic university campuses. The focus of the program's course of study is on creativity and critical thinking, as empowered by the languages and methodologies of the arts, technology and business. It draws on the talents and influence of faculty and leaders from multiple disciplines and industries to empower the next generation of disruptors and professional thought leaders who will apply their skills in a global arena. USC's strategic location in Los Angeles, widely viewed as the creative and media capital of the world, provides an unrivaled opportunity for students to learn in a living laboratory in which media, technology and the arts are deeply intertwined. In addition, the university's proximity to the city's burgeoning "Silicon Beach" and its vibrant downtown Arts District, as well as Northern California's Silicon Valley, provides access to the world's premiere creative and technology companies and institutions from which students can learn and draw inspiration. Students who complete the undergraduate course of study in the Academy will graduate with a Bachelor of Science in Arts, Technology and the Business of Innovation, and possess an unprecedented combination of knowledge and skill. Crafted via a unique and groundbreaking integration of its core disciplines, the degree facilitates each individual's ability to engage differently and successfully with a dramatically changing, tech-driven global marketplace, and to address some of the world's most intractable problems. Academy majors and minors fine-tune their ideas and complete working models, systems or prototypes in the Garage, the Academy's collaborative creation space. Located on the top floor of USC's Steven and Kathryn Sample Hall, adjacent to the Ronald Tutor Campus Center, the Garage contains state-of-the art learning and networking spaces, maker and fabrication studios with 3D scanning and printing capabilities, high-powered computer work stations, and spaces for individual and group work, or even down time. In addition to the Garage, students will soon make and learn in the Academy's new primary home, Jimmy Iovine and Andre Young Hall, scheduled to open in 2019. The facility will offer approximately 10,000 square feet of makerspaces, and will house cutting-edge technologies, workshops and flexible studios to nurture collaboration, engender innovation and support the development of creative ideas, inventions and startups. Students work both individually and in self-directed teams, and are guided by faculty and industry mentors that may include artists, designers, technologists, founders, venture capitalists, public policy leaders, philanthropists, global entrepreneurs and more. In fall 2017, the Academy welcomed its first class of graduate students to the Master of Science in Integrated Design, Business and Technology program. This online graduate degree program provides a first-of-its-kind interdisciplinary education at the intersection of the educational and professional disciplines central to our changing world. The program creates leaders with diverse and creative ways of thinking and doing – professionals trained to recognize and cultivate innovation, catalyze change, and leverage new opportunities to not only support, but also help shape and build our rapidly evolving economy. 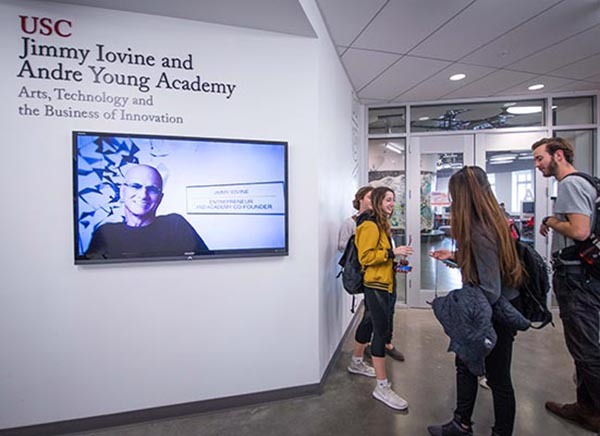 The Iovine and Young Academy offers a Bachelor of Science in Arts, Technology and the Business of Innovation and a Master of Science in Integrated Design, Business and Technology. For final grades of C+, C or C- in a required Academy course, the student must enroll in an approved 1-unit Academy Independent Study designed to ensure the student has obtained sufficient skill and knowledge in the subject area. The student must enroll in the Independent Study in the semester immediately following the term in which the insufficient grade was received (excluding summer session), and must receive a minimum final grade of B- in the Independent Study. Failure to receive a minimum final grade of B- in the Independent Study will result in a determination of unsatisfactory academic progress, and ineligibility to continue in the major. Substitutions for the Independent Study may occur at the discretion of the director, based on an evaluation of the academic needs of the student, and/or course or instructor availability. For final grades of D+, D, D-, F or NC in a required Academy course, the student must repeat the course in order to ensure sufficient skill and knowledge in the subject area. The student must repeat the course in the semester immediately following the term in which the insufficient grade was received (or at the earliest opportunity, i.e., in the next semester it is offered), and must receive a minimum final grade of B- in the repeated course. Failure to receive a minimum final grade of B- in the repeated course will result in a determination of unsatisfactory academic progress, and ineligibility to continue in the major. Students may repeat a maximum of two required Academy courses. Receipt of a D+, D, D-, F or NC in a third required Academy course will result in ineligibility to continue in the major. Note: If a student's grade results in the need to seek remediation as described above, students are advised that, due to prerequisites and other program elements, such remediation may affect the student's ability to register for subsequent course work and could result in a delay of the anticipated graduation date. The Iovine and Young Academy offers minors as supplements to major fields of specialization in other departments and schools. The minors offered in the Academy are: Product Design, Disruptive Innovation, Designing for Experiences, and Multimedia for Designers and Entrepreneurs. There is a separate application for Academy minors available at iovine-young.usc.edu. Candidates for the minors in the Iovine and Young Academy will be counseled by an academic adviser in the school. Developed to complement Academy course work, RLM sessions augment students' classroom education and meet their individualized needs by providing them with critical learning opportunities, but without the full infrastructure of a semester-long course. As a result, RLM sessions are diverse enough to respond to a wide variety of student interests, and flexible enough to deliver each subject in the most useful and relevant way. Participation in RLM sessions is expected for all undergraduate Academy students and open to graduate students. Most sessions take place on Fridays from 10 a.m.-12 p.m. Additional alternate times may be scheduled on a case-by-case basis. Admission to the Iovine and Young Academy is granted through the USC Office of Admission. The incoming freshmen and external transfer application deadline for fall 2019 is December 1, 2018. Specific requirements and additional information are available at iovine-young.usc.edu. Admission to the Academy's Master of Science in Integrated Design, Business and Technology program is offered for fall, spring and summer semesters. Specific requirements and additional information are available at design.usc.edu/admissions. The Academy will consider entrance into the major for current USC students. While completed USC course work will be taken into account, there is no guarantee it will be credited toward Academy requirements. For example, a sophomore may not be able to transfer to the Academy with sophomore standing. Credit and standing will be considered on a case-by-case basis. Admission to the Academy is limited to fall semester only. The application deadline for fall 2019 is January 1, 2019. Specific requirements and additional information are available at iovine-young.usc.edu. The Academy will consider entrance into the major for current students at other two-year and four-year higher education institutions. While completed course work will be taken into account, there is no guarantee it will be credited toward Academy requirements. For example, a sophomore may not be able to transfer to the Academy with sophomore standing. Credit and standing will be considered on a case-by-case basis. Admission to the Academy is limited to fall semester only. The application deadline for fall 2019 is December 1, 2018. Specific requirements and additional information are available at iovine-young.usc.edu. Academic advisement is provided to students at the Student Affairs Office in HSH 101. The staff adviser provides information regarding academic life at the university, program requirements, policies and procedures to assist students with their degree completion. Undergraduate majors are required to meet with the adviser before registering each semester. Appointments may be scheduled at most times during the academic year. Under special circumstances course waivers and substitutions may be granted. All course waivers and course substitutions must be approved by the dean of the Academy or her designee. Undergraduate and graduate programs are assessed the university-wide tuition rate. The university reserves the right to assess new fees or charges. The rates listed are subject to change without notice by action of the Board of Trustees.